Our shellfish come from the River Fal, in the area surrounding the King Harry Ferry and Carrick Roads. They are harvested using a variety of methods including free diving and hand picking. I have over 4 years of experience working the river; first as employees on the mussel farms, and since as an independent business. The majority of our mussel is free dived from the underside of pontoons and boats up and down the river. Constant immersion allows the mussels to feed 24 hours a day. This allows them to reach a very large size, as well as making the meat yield from them exceptionally good. Hand diving our mussel means that we only take as much as we need for the week ahead, making our harvesting method extremely sustainable. Mussels are cleaned by hand. This reduces the shock to the mussel compared to machine cleaned resulting in less mussel death and a longer shelf live. The mussels are then placed in tanks for a minimum of 42 hours. As water is pumped over them, it is passed in front of an ultraviolet filter which kills any bacteria that may be present. Our aim is to provide affordable sustainable shellfish with a low carbon footprint. We believe this can be achieved by using our time and practices that support the environment, rather than cutting corners by using machinery and heavy equipment. Late in the year of 2010 we found out our employers were selling their mussel farm, leaving us jobless in a difficult economic climate. 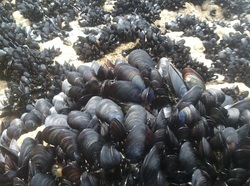 Large amounts of the mussels we used to harvest on the farm were being shipped around the country. We both love working outdoors no matter what the weather and we are passionate about good quality local seafood. As a result we decided to develop a business to supply local mussel to local people. Our first year, like many other businesses, has had many lows and difficulties. Mountains of red tape, algae blooms, the boat sinking, and many more problems, have made it a very difficult first year. On the flip side we have had a lot of support from friends and family and other local business. A big mention has to go to The King Harry Ferry Company, in particular Tim Light, who has helped us with a premises, advice, and continuing support. Without their help we couldn't have got our idea off the ground. We also had a great opportunity when we were filmed for Food Networks new show 'Andy Bates Street Feasts'. We had a fantastic day taking Andy free diving for mussels and cooking them for the public on The King Harry Ferry. Andy is already very experienced himself in street food, he's on a mission to help us fall in love all over again with some Great British Classics. His pies have become legendary on the street food scene. It was great working with him as he is just as passionate as us about good produce and great food.